It is now a public document having been tabled in the ABG House in March 2014 and the National Parliament in February 2015. 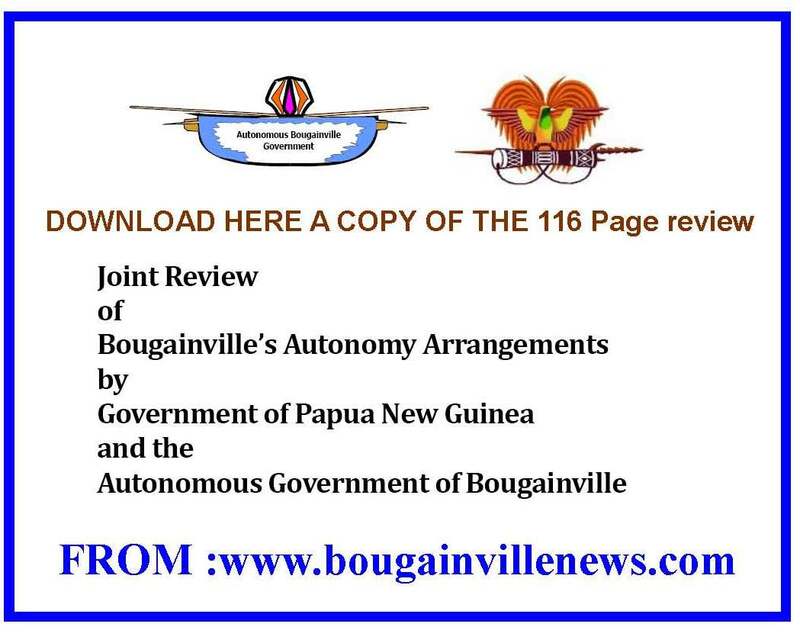 This is a joint review by both governments of Bougainville’s autonomy arrangements as required under the constitutional laws. The review was due in 2010 and was not initiated until 2013. This report, the Review, is the joint report of both governments. It is informed by six separate reports prepared by independent experts appointed by both governments. Their reports are contained in a supplementary volume. The views expressed in those reports are the views and opinions of those experts and they do not necessarily represent the views of either or both governments. Both governments have decided to be forward looking and practical in accepting this joint report. Establishing Bougainville’s autonomy is a new journey for all parties to the Bougainville Peace Agreement. It was to be expected that there would be blockages, stumbles and some disagreements. Nonetheless, considerable progress has been made since the signing of the Peace Agreement. The Review sets us on a joint path to remedy some of the major weaknesses while at the same time preparing for the Referendum which is due in the period May 2015 to May 2020. The Review contains Joint Resolutions – actions by both governments at the JSB held at Kokopo on 18 October 2013 and refined at the Referendum Committee 26 October 2013. The governments will agree an implementation plan against which we will monitor progress and report to the JSB, and the respective parliaments. The Review contains a significant level of background material. The Review will be read by people who may not have access to essential information about Bougainville. We hope that this information will contribute to greater understanding of the broader context for the Joint Resolutions. As required by the constitutional laws the Review will be tabled in both parliaments through the National Executive Council and the Bougainville Executive Council respectively. The Referendum Committee directed that these Joint Resolution be referred immediately to the respective Cabinets for endorsement and tabling in the respective Parliaments with the Joint Review and the Reports of the Independent experts as provided under Section 337 of the Papua New Guinea Constitution. 1.1 Joint planning for the next review of the autonomy arrangements will commence in late 2014 with the review to be conducted in the first quarter of 2015. 2.1 The Bougainville Constitution will be reviewed by the ABG in 2014. 2.2 The recommendations from the constitutional review will be made available to the independent experts who conduct the analysis that contributes to the 2015 joint review by the National Government and ABG of Bougainville’s autonomy arrangements. 3.1 The ABG needs to articulate in a brief accessible document the kind of society Bougainville desires to be in the long term (not just political independence) and formulate a long term higher level strategic vision and plan for realizing the espoused vision based around the aspirations of the Bougainville Peace Agreement and the people. All other planning and service delivery functions should take their cues and direction from the strategic vision. 3.2 The Bougainville Awareness Framework will be the basis for a comprehensive (region-wide, multimedia and direct face-to-face dialogue) awareness campaign be undertaken to inform the people and leaders of the strategic vision, the meaning of autonomy, how it is being implemented and its benefits, and the context and process for the impending referendum. 3.3 The ABG will take responsibility, with the National Government, for initiating a regular series of briefings with local and key national political and public service leaders to seek to significantly increase their awareness and understanding of Bougainville’s vision and entitlements. provide guidance to ensure that all future requests for the draw down of powers and functions, commencing with environment and health, comply with Sections 3 and 4 of the Organic Law and where applicable Section 43 of the Bougainville Constitution. 4.2 The drawdown of powers and functions process will be coordinated by the Chief Secretary and Chief Administrator respectively to expedite the evolutionary and smooth drawdown of functions and powers through the preparation of legislation for consideration by the Bougainville House of Representatives. 4.3 Greater attention will be given to calculating, negotiating and agreeing the on-going funding arrangements for each function and power to be drawn down by the ABG according to the provisions of the Organic Law. 4.4 The governments will work together to seek additional expert resources (including from development partners) to strengthen the ABG to manage the orderly draw down of powers and functions, and their subsequent implementation, particularly to contribute to analysis and policy development in legal, staffing, planning, financial and organisational aspects. 5.1 Law and order – that priority be given to strengthening law and order (weapons, police and community justice) and resolving key existing conflicts that continue to hinder return to normalcy, peace and development in parts of Bougainville (e.g. Konnou and Siuwai crises). Support be extended to strengthening economic institutions for growth of private enterprise. A specific initiative in exploration of impact projects needs to be investigated with a view to creating much needed employment. 5.3 Infrastructure investments be coordinated through the Joint Project Management Unit such that all of the Region is connected via transportation and communications links in the shortest possible time. Lost generation – that Education Division (in collaboration with relevant divisions such as Community Development, Veterans Affairs, development partners and NGOs) design and implement a specific education program targeting the lost generation. Certification and Accreditation of artisans – that ABG through a relevant division, design and implement a Trade Testing, Certification and Accreditation program for skilled village artisans in anticipation for the vocational employment when mining and other economic opportunities commence. Opportunities for the provision of vocational and technical education must be explored as a matter of urgency with reforms to entry requirements into vocational and technical schools to be started. 5.5 Strategy for Less Developed Areas – all three regions in Bougainville have pockets of isolated communities facing severe under-development. Examples include Visai in the Buin district, Rataiku in Siuwai district; Marau in Bana; Torokina; Kunua; Rotokas; and West Coast of Buka. The ABG will formulate a strategy for progressively linking and opening up these areas to social and economic development. 5.6 The governments will contribute to the immediate expansion of the reach of radio throughout the Region by ensuring current projects are implemented expeditiously. 4.5 The governments agree to discuss and negotiate a solution to the payment of outstanding Restoration and Development Grant calculated according to law and to ensure that it is then properly calculated, appropriated and paid annually to the ABG in a timely manner. 4.6 The ABG will prepare detailed budget submissions for each new function and power delegated or transferred to the ABG detailing staffing and goods and services budgetary requirements for the first and subsequent three years of implementation in Bougainville of that function or power. These submissions will be endorsed by the BEC, and where required by the Bougainville Constitution, the House of Representatives. 7.1 The ABG will establish an internal audit function within the Administration before 1 January 2015 to be funded under the Recurrent Grant arrangements. 7.2 The PNG Auditor General will establish an office in Buka before 31 March 2014 with ABG assistance for housing and office space. 8.2 The ABG will seek to capture in PGAS greater detail on the geographical spend for all development activities. 8.3 The ABG will seek partner support to undertake detailed annual expenditure analysis to contribute to the development of future budgets and assist in the prioritisation of expenditure for service delivery and enhancing autonomy. 8.4 The ABG will work with all development partners to seek to have their contributions recorded in the ABG annual budget. 9.1 The ABG will commission expert assistance to undertake economic and financial analysis on the cost of various options to implement the BEC’s vision for Bougainville taking into account various development scenarios over the next five to ten years. 10.1 The ABG will significantly improve the level of reporting on financial matters and projects to the BEC, indivicual ministers, the Bougainville House of Representatives, the National Government, development partners and the community. 10.2 The ABG will develop and then implement a comprehensive capacity development strategy to build the competencies and capabilities of the new ABG Finance and Treasury Department from January 2014. 11.1 The ABG will host a Taxation and Revenue Summit in early 2014 to educate the political leadership and the public service of both governments about the tax and revenue arrangements and issues available to Bougainville under the existing Organic Law. Its objective will be (a) to achieve a consensus on a broad strategy, and priorities, to secure improved efficiency and effectiveness in administering the taxation and other revenue entitlements and (b) to contribute to future revenue policy development being properly informed particularly when it seeks to improve the ABG’s ability to achieve the fiscal objectives of the Peace Agreement. 11.2 Based upon the outcome of the Revenue Summit ABG will review its Office of the Chief Bougainville Collector of Taxes to assess future staffing and capacity needs. 11.3 The ABG will activate arrangements to establish the audit function provided in the Organic Law to monitor the collection of revenues by the IRC. 11.4 The IRC will be provided with additional resources in Port Moresby, the regional office and in Buka to undertake its role including an increased awareness program across the region. 12.1 An immediate joint review be carried out on NCOBA to determine its continued relevance and its future roles and responsibilities. The ABG and the National Government should give serious consideration setting up the ABG to manage coordination with the National Government on its own with current NCOBA resources shared between an ABG representative office and the ministry. 12.2 The ABG with the assistance of the National Government will take immediate steps to put in place a weapons disposal plan and set a concrete time to implement weapons disposal prior to 2015. It then should move quickly to implement this plan. 12.3 The ABG take immediate steps to put in place a peace and reconciliation plan and that this plan be immediately implemented before 2015. 12.4 The new structure and operations of the Bougainville Public Service will strengthen and enhance reporting and accountability arrangements including enhancing the roles of ministers and the BEC in setting policy and monitoring the performance of the Administration. 12.5 The ABG will develop and implement a capacity building programme, based around the White Paper on Councils of Elders to resuscitate the capacity of Councils of Elders and Village Assemblies to ensure that they are operational and remain sustainable as the second tier of government in Bougainville. 13.1 The governments note the expert’s view that when all the reports are read together and a number of indicators are looked at it is doubtful if it could be said that the ABG was achieving the required standard of good governance in public administration as at mid-2013. 13.2 The governments agree that for future joint reviews greater clarity is needed on the set of indicators (having reference to the constitutional definition) against which good governance is to be assessed taking into account the available sources of quality data. 13.3 In early 2014, with Department of Provincial and Local Government Affairs’ assistance, the ABG will complete a joint organisational assessment using an agreed set of Key Result Areas and indicators based upon the Provincial Performance Improvement Initiative, to be repeated in early 2015 to feed into the 2015 joint review of the autonomy arrangements. ABG and Department of Provincial and Local Government Affairs will seek to involve a representative from East New Britain Province (and/or Milne Bay Province) in the assessments given those provinces’ above average performance in service delivery. 13.4 The ABG will complete its 2014-2016 Corporate Plan by 31 March 2014. 14.1 The governments agree that they will apply significant resources, with the support of development partners, to implement the BEC approved Capacity Development Strategy for the Autonomous Bougainville Government (November 2012). 15.2 The ABG will undertake a review to assess the required level of resources for the House for the next five years, including recruitment of its necessary administrative support staff, build office capacity and fund resources necessary. 15.4 The ABG will immediately recruit the Bougainville Principal Legal Officer, the principal adviser to the BEC, through an open and transparent process and support the office with lawyers, support staff and resources. 16.2 As part of and under the recently launched police modernisation program, GoPNG will give special attention to infrastructure capacity development, funding of resources and police manpower in Bougainville to bring police service to at least pre-crisis level. 16.3 The Police Service, Correctional Service, the Courts and the other law and justice constitutional offices are an integral part of law enforcement, maintaining peace and order and for public security. Both governments will give attention to building the capacity of all aspects of the law and justice system in order to prepare the ABG to be able to enact its own laws to transfer of related powers and functions when appropriate and affordable. 16.4 Given the importance of establishing and maintaining law and order in Bougainville both governments will support the police and correctional services special working groups to analyse and develop appropriate short and medium term funding proposals for the police and correctional services in Bougainville based upon an optimal configuration of staff and facilities. 17.1 The governments will review the 15-step strategy and seek to implement it in full consultation with each other. 17.2 The governments will as a matter of urgency meet in the Joint Consultative Coordinating Committee on Panguna Negotiations and agree the budget and potential sources of support for a comprehensive program of consultation, analysis and information-sharing so that the ABG, the landowners and the National Government are fully prepared to advocate and negotiate among each other and with BCL the new terms and conditions for mining and exploration leases associated with Panguna Mine. 17.3 Both governments will continue to support building staff capacity of the ABG Mining Department and other departments in order for them to be fully prepared to administer, implement and monitor mining (including issuing, managing and monitoring of mining tenements) and other legislation associated with the possible re-opening Panguna Mine, other mining operations (if any). 17.4 The ABG will continue to consult the National Government through the Department of Mining Policy and the Mineral Resources Authority on the ABG’s proposed transitional law in accordance with the Alotau Agreement, prior to the House enacting the law. The ABG to continue wider consultation of all stakeholders in the ARB in formulating its mining legislation and the Panguna negotiations. 18.1 The governments will meet quarterly in the Referendum Committee, and then at the Joint Supervisory Board, to monitor and discuss the preparations for the Referendum. 18.2 The governments agree that the Referendum will be conducted by an independent agency established for that purpose under Section 58 of the Organic Law on Peace -Building in Bougainville-Autonomous Bougainville Government and Bougainville Referendum 2002.
g. reviewing the legal and administrative Rules for the Conduct of the Referendum as contained in the First Schedule to the Organic Law taking into account issues and experiences arising from two Bougainville elections and any other relevant matter. j. complying with the Bougainville Constitution’s general and specific provisions for consultation within the Region including with traditional leaders and others. 19.1 The government will support the independent experts to meet with the people of Bougainville through a series of public consultations to close the consultation loop through feedback and deliver the Joint Review to the communities. These sessions will include representatives of both governments.